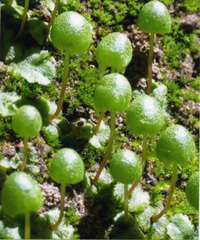 Asterella palmeri, a liverwort. Photo by C. Wishner. 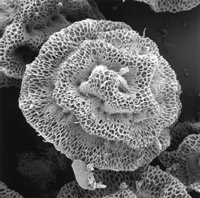 Scanning electron microscope images reveal the distinctive features of liverwort spores: Riella americana (above) and Asterella californica (below). Photos by B. Doyle. At the University of California, Santa Cruz, William T. Doyle is best known as the founder and longtime director of the Institute of Marine Sciences (IMS). Among California botanists, however, he is known as the leading authority on the state's liverworts and hornworts, small nonflowering land plants related to mosses. A professor emeritus of ecology and evolutionary biology, Doyle has now published a comprehensive reference on the liverworts and hornworts of California, including detailed descriptions of all the known species and keys to their identification. Coauthored by Raymond Stotler of Southern Illinois University, it is the first such catalogue to be published since 1899; it appears in the April-June issue of the botanical journal Madroño. Doyle began studying liverworts and hornworts early in his career and took them up again after retiring as IMS director in 1991. The study of these small, inconspicuous plants requires "an innate appreciation for things small and a willingness to spend time to seek them out," Doyle wrote in the introduction to the Madroño article. "They're the plants people kneel on to take pictures of flowers," he said. Viewed up close, however, they can be quite beautiful, with striking features such as spore-bearing structures that look like tiny umbrellas. "They are very old, simple land plants," Doyle said. "In the Devonian and Carboniferous periods [more than 300 million years ago], there were liverworts that look almost identical to the ones we see today." Doyle's interests include not only the plants themselves, but also their natural habitats. His field studies have taken him to every corner of the state. "When I was on the faculty, I didn't have much time to do field work, but after I retired I decided to have some fun exploring California's tremendously diverse habitats," he said. "I realized that these plants have not been well studied in California." Staying in campgrounds and taking day hikes and backpacking trips to remote locations to collect specimens, Doyle has put 283,000 miles on his Ford Explorer in just the past seven years. At age 78, he shows no signs of slowing down, although he acknowledged that a 12.4-mile day hike in Yosemite this summer "took a lot out of me." Mosses, liverworts, and hornworts are known collectively as bryophytes, and those who study them are bryologists. The new publication was suggested by two bryologists who were documenting the mosses of California and urged Doyle to write up the information he was collecting on liverworts and hornworts. He tried to make the catalogue accessible not only to professional bryologists but also to students and amateurs. His coauthor, an expert in the taxonomy of bryophytes, helped with the identification and naming of the specimens and the descriptions of new species. "I have all the fun, doing the field work, and he does a lot of the library research," said Doyle, who is currently helping to document the bryophyte flora of Yosemite National Park and finishing work on a bryophyte flora of Pinnacles National Monument. "Agencies such as the National Park Service are increasingly interested in knowing all the plants and animals that are under their jurisdiction and whether any of them are in need of protection," he said. "There are many bryophytes that grow only in California or on the West Coast." Bryophytes, like ferns, reproduce by spores rather than seeds. "The one-celled spores of liverworts and hornworts can be both spectacularly beautiful and distinctive for the species," Doyle said. He has been using the scanning electron microscope (SEM) in UCSC's Microscopy and Imaging Laboratory to examine and document the diversity of bryophyte spores, with the help of lab director Jonathan Krupp. 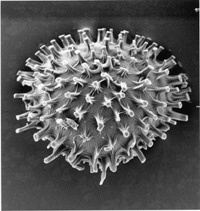 Because SEM photos of spores are so helpful in identifying species, Doyle contributes his photos to a web site where they are readily available to researchers and students. After getting "sidetracked in administration" at UCSC, where he had an enormous influence on the campus and its marine science programs, Doyle is clearly enjoying his return to the botanical subjects that originally interested him.